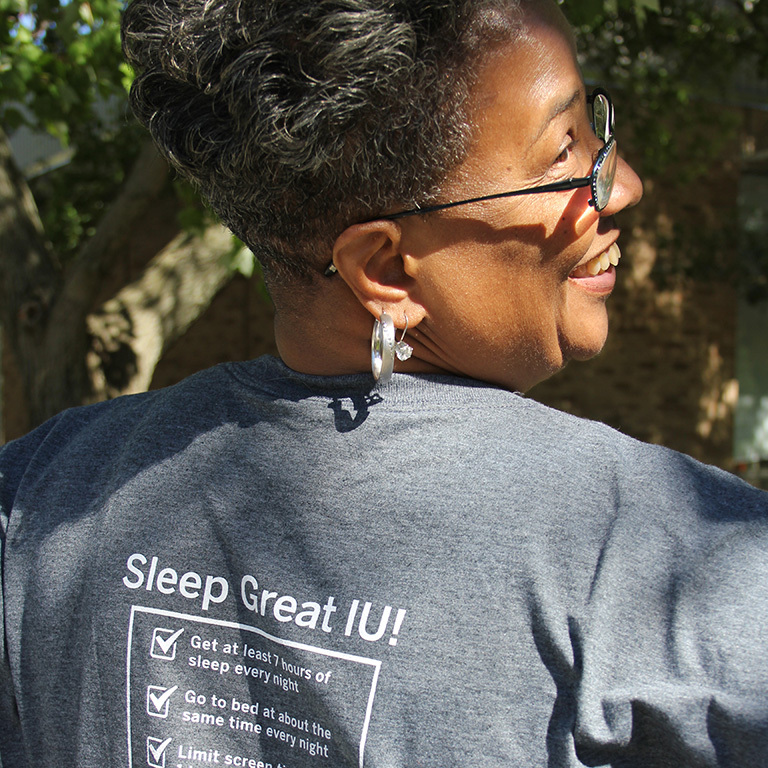 How IU employees took on the challenge of sleeping better. Getting a good night’s sleep empowers us by helping us regulate our mood, prevent chronic disease, improve immune function, and so much more. And even though we all need it, how we get a good night’s sleep can be one of the most unique things about each of us. How we get a good night’s sleep can be one of the most unique things about each of us. In this Journey story, IU employees show us how they took on the challenge of sleeping better. 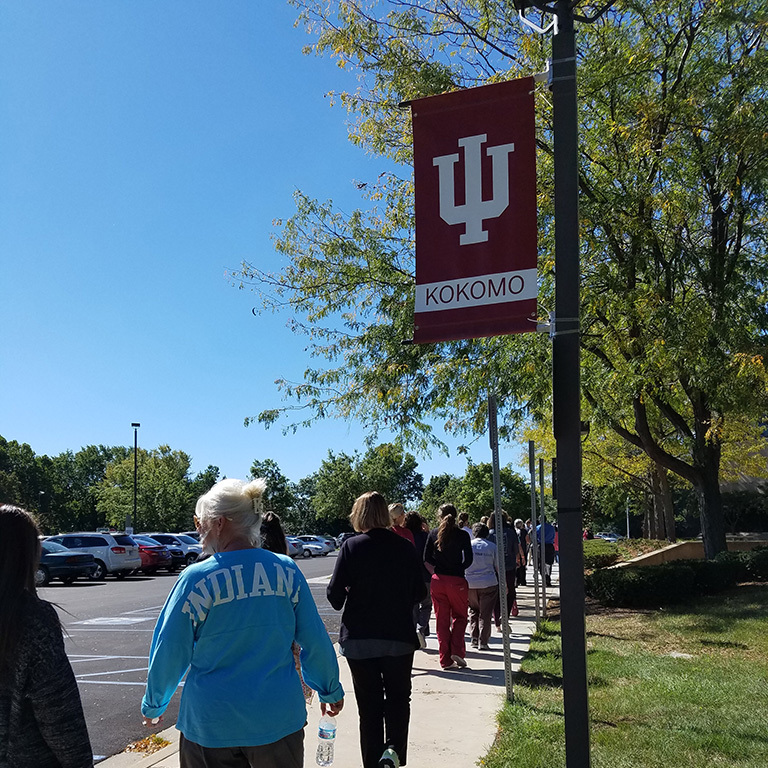 A visit to IU Kokomo gives you the sense that it’s all about community — and that tight-knit community was strongly on display during the 2016 Sleep Walk. Gabby VanAlstine, director of Human Resources at IUK, explains that the culture is focused on mission. “At its heart, our mission is that we’re here for our students — to let them know we care about them, their health, and their preparation for the future,” she says. About 1 in 5 IUK students have had sleep difficulties that disrupted their academic performance. 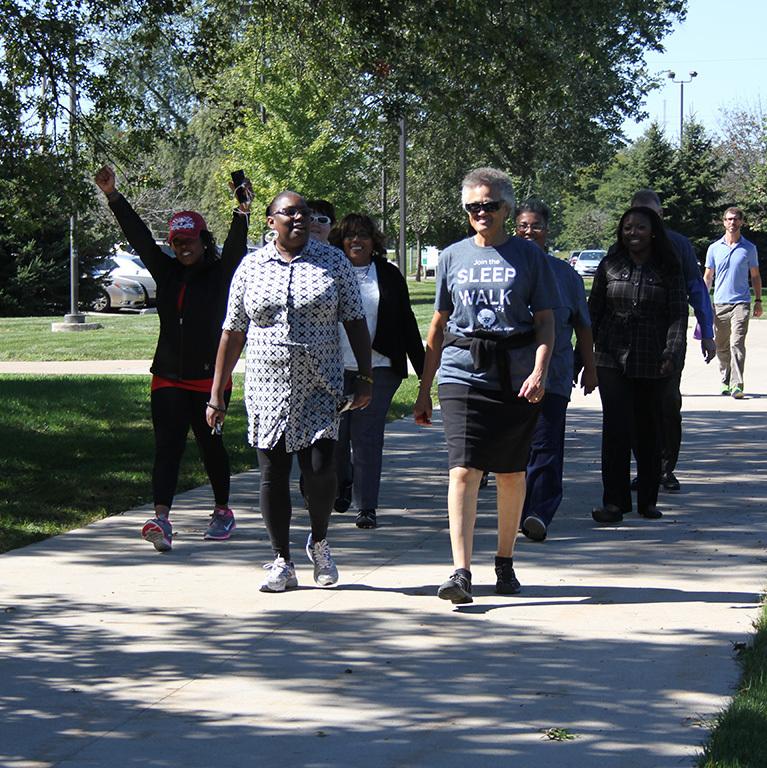 Faculty and staff from across the campus rallied to promote the Sleep Walk and sleep health awareness. 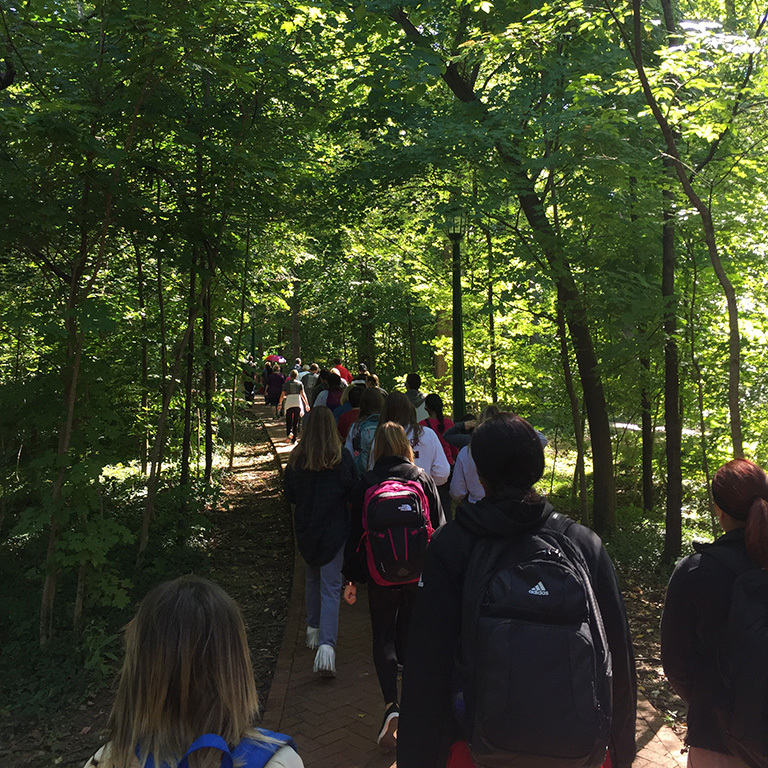 The Healthy Initiatives Committee created and distributed a sleep infographic; the Office of Media and Marketing created a fresh, student-focused social media campaign; and faculty even invited their students to participate in the walk with them. 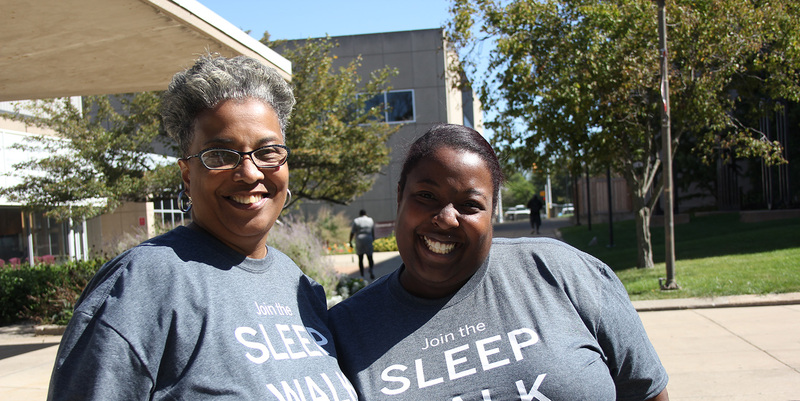 "To walk side-by-side with [my professors] at the Sleep Walk really struck me as leadership by example." Hunter even got the chance to practice her skills in health education by discussing the sleep-altering effects of blue light in a video produced by the IUK Office of Media and Marketing. *The survey, which IUK participates in every two years, is administered by the American College Health Association and sponsored by the IUK Healthy Initiatives Committee. The survey helps guide efforts for student programming, allows IUK to compare its outcomes with the rest of the country, and provides data for faculty and staff on health issues common to students. Throughout her 17 years as an employee at Indiana University, Lena Williams has seen it all — including, thankfully, the resolution of her Sleep Apnea. “Before I was diagnosed with Sleep Apnea, I just assumed it was normal to be so tired. I was working two jobs, so I thought that was why I felt exhausted,” says Lena. After her diagnosis, she was able to manage her sleep apnea with a C-PAP machine. But was during a routine visit to IU Northwest’s Dental Clinic in 2015 that she learned the root of the issue might oversized tonsils. Lena was later able to confirm this with her Ear, Nose, and Throat (ENT) doctor, which lead to the cure of her sleep apnea by removing her tonsils and uvula. Taking these steps allowed her to sleep better at night — the effects of which have been life changing. “Sleep is so important. It wasn’t until I started getting restful sleep that I realized how much I had been missing out on,” she says. Before, Lena was taking vitamin B supplements to help her stay energized throughout the day. Her naturally bright and perky personality took some real effort to muster in the morning. But now, “I wake up, I have energy, and I’m ready to go,” she says. Pay attention to your body and the signs it’s giving you about the quality of your sleep. And second, don’t be afraid to get professional help with sleep if you need it. “There are many sleep-related conditions besides sleep apnea out there. Pay attention to your body and the signs it’s giving you about the quality of your sleep,” she says. Sleep is so important. It wasn’t until I started getting restful sleep that I realized how much I had been missing out on. Getting quality sleep can be hard for those who work nights. But after twenty-five years of shift work at IU, and six years of military service, IU Bloomington’s Robert Griffin has a routine that works for him. As a custodian who works third shift, “you have to learn how to adapt,” he says. Griffin’s experience with working nights began as a Boatswain’s Mate in the Navy. “We would have to keep watch at night, and I would be awake for a four-hour shift starting at 11:45 p.m.,” he remembers. Working nights often means juggling social demands of friends and family who are on a daytime work schedule, while also trying to eliminate factors like sunlight or traffic noise. "Everyone can benefit from trying out healthy sleep habits, and sticking with the ones that work best." He’s also found a sleep routine that helps him unwind and get to sleep quickly after work. “I get home around 6:30 a.m., relax, and maybe even grab something to eat before being in bed by 7:30 a.m. Then I’ll wake up about 2:30 p.m., which gives me some free time before heading back to work around 9:00 p.m.,” says Griffin. This schedule allows him to take care of everyday errands and, importantly, spend time with family and friends. Griffin participated in Healthy IU’s “Sleep Great IU!” Challenge, and was pleasantly surprised to pick up another healthy sleep habit: avoiding blue light (from devices such as phones, televisions, and computers) in the hour before he went to sleep. Learn how blue light affects sleep here. “I noticed that after looking at my phone, I’d close my eyes and still see the blue light. So I’ve made more of an effort to not look at my phone before bedtime,” he says. Interestingly, while night shift workers face unique challenges to getting restful sleep, both day shift and night shift workers reported similar levels of satisfaction with their sleep habits at the beginning of the “Sleep Great IU!” Challenge (65% and 61%, respectively). And after practicing the healthy sleep habits of the challenge, day shift and night shift workers reported similar levels of improvement (84% and 78%, respectively). 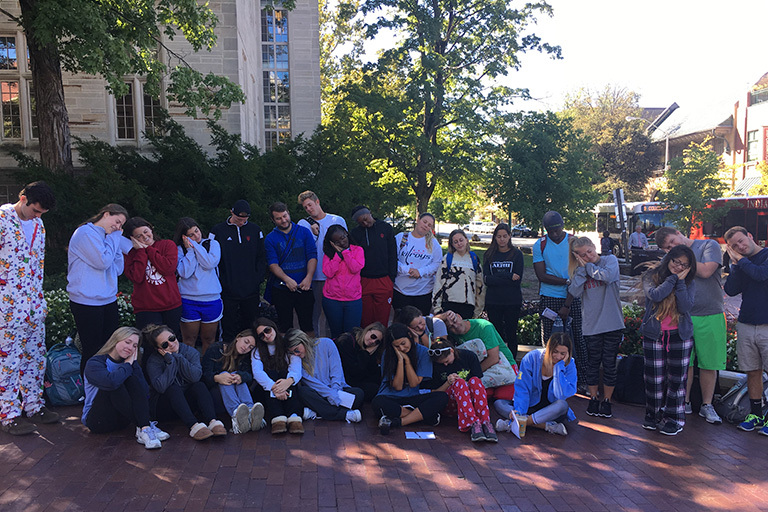 View the “Sleep Great IU!” Challenge Summary Report here. This speaks to the importance of a sleep routine, whether we work days or nights — one that fits our unique needs, the way that Griffin’s does. “Everyone can benefit from trying out healthy sleep habits, and sticking with the ones that work best,” he says.